Reliable Serial Communications will suit any control needs. E3C Compliant This Device is E3C Complaint allowing 256 NCD Devices to Share a Single RS-232 Serial Port. Setup for the R25DPDTCN RS232 relay shown above using the optional QS12-F6 Quick Start Kit. Simply Connect the Serial Interface to your Relay Controller, connect the Power and Serial Cable and start sending commands. Also available is our QS12-F6 Quick Start Kit. 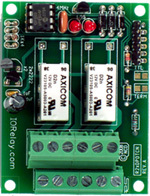 Kit includes a high quality regulated switcher supply, serial cables, and an RSIO adapter board used to add a standard serial and power connector to this relay controller.